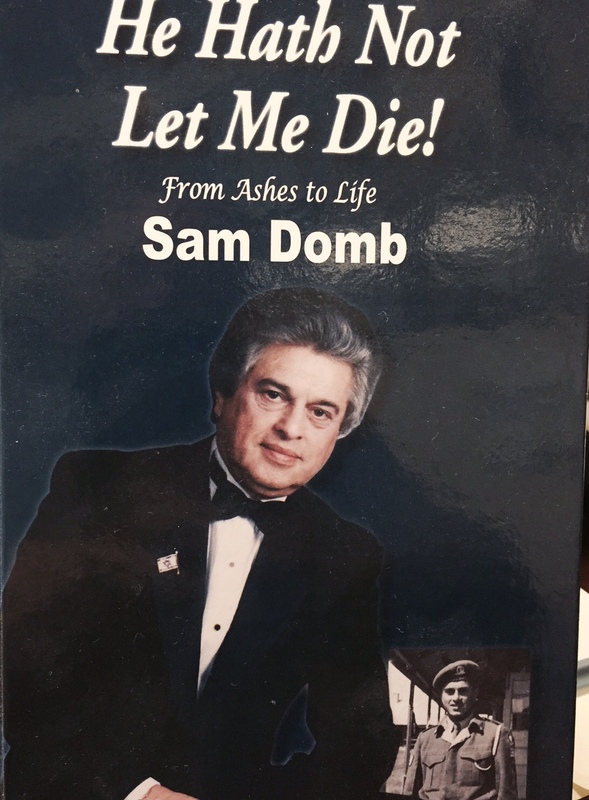 The enthralling story of Sam Dombs early years is told in “He Hath Not Let Me Die”. The book paints a vivid and horrifying picture of Europes darkest days in World War II. This work sweeps the reader along at a breathless pace, telling the tale of a Jewish boy who, despite frightful events and unending trials, survived against all odds. From the inferno of the Holocaust, he immigrated alone to Israel, acclimated there and served in the IDF. 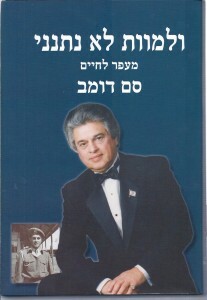 Subsequently, his lifes journey led him to the US, where he has since resided, and is today a business mogul, a noted Jewish philanthropist and prominent leader of his community and a Jew ever serving his people and the State of Israel. Sams book tells how the Nazis made his Polish town, Poltosk, judenrein (free of Jews). The Nazis drove Sam, then five years old, and his father, mother and three sisters and all the Jews out of Poltosk. As his mother was carrying Sam, she stumbled and was immediately shot. His father knew if he stopped to help, the entire family would be killed. He grabbed Sam, and without looking back, continued the march. In the forest a 10 year old Jewish boy helped Sam escape. To this day, Sam does not know the name of that boy, but calls him a malach, (angel). Sam was compelled to flee and wander along arduous paths, starving, thirsty, hiding out in basements and crevices, in forests, beneath bridges and between corn stalks, utterly destitute. It was a childhood that left its bitter mark on his impressionable soul and scorched its burning seal on his powerful personality for the duration of his lifetime, said Rabbi Yonah Metzger, Ashkenazi Chief Rabbi of Israel. Starting out as a dishwasher, when he arrived in the United States, he eventually became the owner of a hotel chain in New York. In the process, he befriended many local and national political leaders and became a confidante to numerous Israeli prime ministers who sought his advice and support. Mr. Domb is a passionate advocate for Jewish issues around the world. In the book, Sam describes all the milestones in his life. While he was enjoying success in America, he was always very aware of what was happening in Israel. He was involved in Israeli affairs and through the years assisted many organizations and supported important causes. Today he is an angel for others. He has become one of the foremost philanthropists of our time, supporting Jewish education, renovating synagogues, and even coming to the aid of the people of Sri Lanka. He was recently honored at the 25th Annual NJOP (National Jewish Outreach Program) Dinner for being NJOPs largest single contributor. In addition, Domb has rescued several New York synagogues from disrepair and helped one Jew after another rediscover the routine observance of Jewish faith. Somebody has to rebuild what is being lost, and hes doing tremendous work, said Shy Yellin, a member of the Carlebach Shul on West 79th Street. This is not about having a legacy, he said several times. I dont need anything like that. I just felt obligated in my heart because of the darkness of my past. I had to do something to light the future. Its a great spiritual feeling sitting in a synagogue that has been restored. That is when I feel G-d smiles at me, he concluded. I Pultusk Board Association of Israel. I am in regular contact with Prof. Ostrowski Pultusk. He told me a lot about you. He also told me about your plan to build a monument at the bridge from where Jews were deported and murdered. In 2012 I organized a trip with 50 people Pultusk unveiling the tombstone. It is very possible that we’ll to the ceremony of the establishment of the tombstone on the bridge. I would like to interview you about the Cruz/Reisner matter. Sam’s life is an inspiration to the generations!